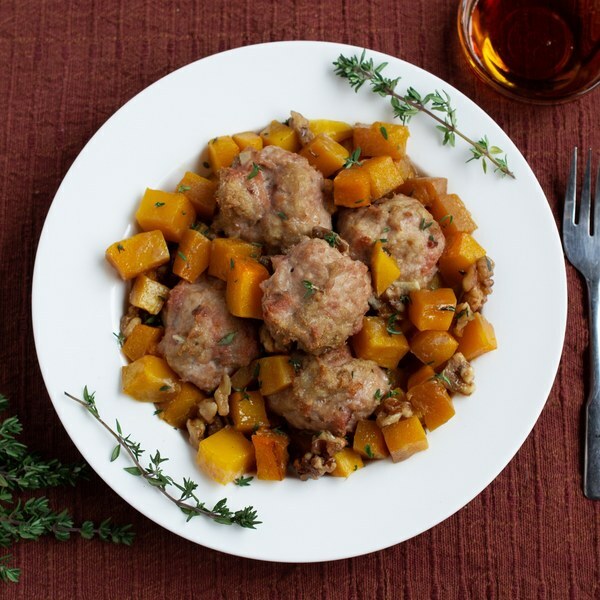 ← Maple Bacon Turkey Meatballs with Butternut Squash & Spiced Walnuts. Wash the butternut squash. Trim off and discard the ends of the squash; halve the squash lengthwise and scrape out the seeds from each half. Peel and cut into ½-inch cubes, about 2 cups per person. Wash and dry thyme. Slide leaves off the stems; discard the stems. In a small saucepan, melt the coconut oil over medium heat. Add maple syrup, cinnamon, thyme and salt. Stir to combine then remove from the heat and add to a medium bowl. Roughly chop walnuts and add to bowl with the coconut oil and spices. Add butternut squash pieces to bowl. Toss to coat and spread out in a single layer on a baking sheet. Peel and mince the garlic. Peel and mince or grate the ginger. Add to a medium bowl. Add ground turkey to the bowl with the garlic and ginger. Mince bacon and add to ground turkey. Season turkey and bacon with cumin, salt and pepper and stir to combine. Form meat mixture into 2-inch size meatballs and place on top of squash. Bake for 15-20 minutes, until meatballs are golden brown and cooked through and squash is soft. To serve, divide squash, spiced walnuts and meatballs between plates. Enjoy!